Reputable boutique jeweller operating from Hamilton, Ontario for over 20 years. Our mission is to provide you with stunning jewellery that is unique in design and of the highest quality. Zoran Designs specializes in custom and made-to-order engagement rings, wedding bands, family jewellery and custom designs for life's special and meaningful moments. Our stocked collection includes unique, artisan jewellery and while many of our designs originate in-house, we also feature pieces from select designers, studios and manufacturers. Engagement ring shopping? Discover some of your options on our BRIDAL jewellery page or get inspired by our featured wedding rings below. Learn about the CUSTOM DESIGN process and view a sampling of some recently completed pieces by browsing through our PORTFOLIO. Meander through our jewellery GALLERIES or see what's for sale in our ONLINE SHOP. Learn a bit more ABOUT us and be sure to CONTACT us if you have an inquiry or wish to set up an appointment. We hope you enjoy your visit! 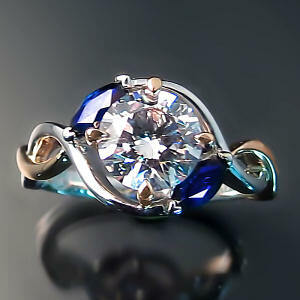 A custom designed platinum engagement ring for a nature lover who appreciates sculptural curves and beautiful details. Roberta’s custom made two tone gold ring: a meaningful redesign project repurposing cherished diamonds. A daisy engagement ring and dainty diamond band for her. Chunky and hammer finished for him. A stunning 1.5 carat, oval cut diamond is the focal point of this elegant, three-stone engagement ring. ORTHODOX CROSSES: Our gold Orthodox cross pendants come in a variety of styles, sizes and price points. Most of our fine jewellery is made to order or custom designed. We are happy to accommodate special requests. Custom made jewellery is our specialty and we always enjoy creating unique, one of a kind jewellery just for you. Whether it's a stunning custom engagement ring or wedding band, a unique cocktail ring or bespoke family jewellery made just for you, we approach each design project with genuine enthusiasm. Custom designed wedding rings for Brittany and Josh. Ever wonder about the process of custom jewellery design and creation? Watch this brief video showing the journey from idea stage to finished product. "Working with Maja of Zoran Design Jewellery was such a comfortable, fun experience as we were planning our wedding. She listened to our interests, she took the time to educate us on custom jewellery, and most importantly she was able to apply her own interpretation of the creative concept that I had been working on for our wedding. One of my favourite memories of the experience was meeting with Maja when she presented us with our finished bands. We are both so pleased and so happy we chose to work with a designer that cares as much about "one-of-a-kind" as we do!" Zoran Designs Jewellery will create fine designer custom jewellery and one of a kind pieces. We offer reasonable pricing on precious and semi-precious gemstones including diamonds, rubies, sapphires, moissanite, and more. A showcase of some of our custom engagement rings and wedding bands. Click on the photo for the full story behind these bespoke wedding rings.